The food shelf is available to persons in need of assistance who live in the ROCORI area school district. To apply for assistance, please bring in a recent postmarked piece of mail showing your name and current address as proof of living in the school district. They may receive assistance once per month. Home delivery is available to handicapped and shut-ins. To arrange for this service, call the food shelf at 320-685-8785. We are located at 217 Main Street, Cold Spring. The ROCORI Area Food Shelf offers Handicap accessibility and a roomy display and storage area for donations. The food shelf is currently open every Monday from 10:00AM – 2:30PM. 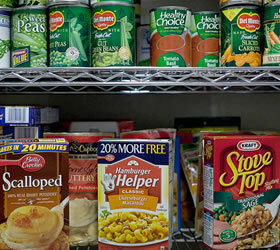 On the third Monday of each month the food shelf is also open in the evening from 5:30 pm – 7:00PM. Days Closed in 2018: May 28 (Memorial Day), July 4, Sept. 3 (Labor Day), Dec. 24 (Christmas Eve), Dec. 31 (New Year's Eve). The Rocori Area Food Shelf will be closed when the Rocori schools close due to weather conditions. If the Rocori schools start 2 hours late, we will still be open as usual. March is an important month since we receive matching grant money for donations received in March. Your donations are doubled by the MN FoodShare's March Campaign. We will be selling Raffle Tickets as our annual fundraiser in March sponsored by the local Lions. Buy a ticket and support the Rocori Area Food Shelf. Donations received in July are matched by Hunger Solutions. School Supply Drive - backpacks with school supplies are distributed in August to families in need. Christmas food baskets are distributed in December. Toys are needed for the Christmas toy program. Please watch for donation boxes labeled "RAFS Toy Shop" located at area retailers. The Christmas Toy Program gives toys and bikes to families with children. Families must sign up for this event. Sign up starts on the 1st Monday of November. Call Vicky (218) 766-2462 with questions. 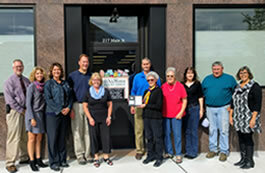 ROCORI Area Food Shelf, Inc.
Food donations can be dropped off at the food shelf during open hours. Food drop boxes are also located at City Hall and Teal’s in Cold Spring and Plantenberg’s in Richmond. The food shelf is a non-profit organization relying solely on donations and grants. We are currently recruiting Board Members. If you are interested in serving on the Board, please fill out the Board Application. The form can be found under the FORMS tab on this website or call us at 320-685-8785 and a manager will send you an application. Members from the Cold Spring Area Chamber of Commerce presented the RAFS Board and Managers with a Member in Good Standing plaque. Some members are missing. September 2017.